After trying this recipe, you may never make pizza dough any other way! The ingredients are simply stirred together, left overnight to rise, and that's it - you're ready to make pizza. This is the perfect recipe for the first timer. Add the water, yeast, olive oil, sugar, salt, and flour into a mixing bowl. Using a heavy wooden spoon, stir together to form a wet, very sticky dough. Do not try to knead with your hands, as it is too sticky to handle. The mixture will seem dry at first, but as you continue to stir together all the flour will be absorbed and it will pull away from the edges of the bowl. Add more flour if needed to form a very thick, very sticky dough ball. Once mixed, cover the bowl with a towel, and leave out at room temperature for 12 to 16 hours. Flour a work surface very well; using a spatula scrape the sticky, bubbly dough onto the flour. Flour your hands and pat down to flatten. 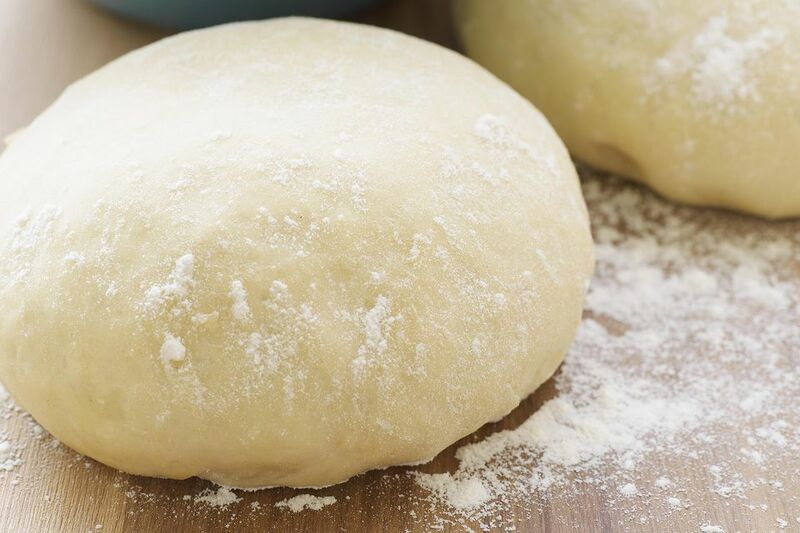 Cut the dough into 2 pieces and using plenty of flour to handle, knead each portion for several minutes to form 2 smooth, elastic, balls of dough. Allow to rest on a floured board covered for 30 minutes. Your pizza dough is ready to use! This dough is even better if kept refrigerated overnight, but let come up to room temperature before shaping pizzas. This pizza dough works equally well for thin-crust or thick-crust pizza recipes. NOTE: As with all dough recipes, the amount of flour will vary depending on weather, the brand of flour, etc. Use as much flour as you need to handle the dough, but keep in mind that the stickier the dough, the better the texture of your pizza crust will be.